When I picked up Throne of Glass by Sarah J. Maas, I certainly wasn’t expecting to love it as much as I did, so I didn’t forsee that I’d be eagerly awaiting its sequel, Crown of Midnight. That’s exactly what I was doing though. Having triumphed and been appointed the King of Adarlan’s personal champion, former assassin Celaena Sardothien is now biding her time, bending to the King’s will and waiting for the day she can be free. Only it’s not that simple. At great personal risk, Celaena hasn’t been killing the men the King has been ordering her to. Instead, she’s been faking their deaths. When she returns from her latest mission and is given the name of her latest target, Celaena finds herself caught up in an increasingly dangerous situation, where she doesn’t know friend from enemy, and where the danger is not just human. Throne of Glass‘s focus was Celaena’s battle to become the King’s Champion, and therefore, beyond initial scenes in the mines of Endovier, it barely left the glass palace Celaena lives in. Crown of Midnight, by contrast, opens up a whole new world, and was all the more compelling a book for it. We meet a host of new characters, discover more about the place where Celaena lives, her past and how the King of Adarlan became so powerful, and we find out more about the political struggles of the world in Crown of Midnight. Maas is adept at world building, so all the new places we are introduced to are well described, and easy to picture. Her new characters, similarly, add a new dimension to the series and retain a sense of mystery. Like Celaena, I couldn’t work Archer Finn out, and despite the fact that he’s a doorknob (an actual doorknob, that’s not an insult), Mort was one of my favourite characters in the novel. But what of the characters we know and love, or hate, from Throne of Glass? Even though we found out more about the King of Adarlan, it only made him more frightening, not less. And there were a couple of minor characters from Throne of Glass, one in particular, who grew even more fascinating in Crown of Midnight. And of course, Nehemia continues to be a favourite of mine – she’s just so kick arse. And then there’s Dorian and Chaol. I confess, of the two men in Celaena’s life, Chaol was by far my favourite in Throne of Glass. While he retains his status in Crown of Midnight, this book really gave me the chance to get to know Dorian, and I liked what I saw. The development of Dorian from handsome prince to someone genuinely conflicted is intriguing to read about, and I felt he had much more depth in Crown of Midnight. And that depth was something I really loved. We also got to find out a lot more about Chaol in this book, and really see him interact with Celaena. He became both a happier character and a sadder one, and both sides were fascinating to see. As Maas continues to build layers onto her characters, I find myself really buying into them. And Celaena. Well, she really goes through the mill in Crown of Midnight, and I can’t say I always like the way she behaves, although I can always see why she’s acting the way she is. Celaena often displays a high level of selfishness in this book, and has a way of completely failing to see things from another person’s point of view at times. She can also be hypocritical, despising qualities in others which she herself displays. But all her faults make Celaena a far more likeable character than if she was perfect, because it’s her faults that also bring out the best in her, that make her loyal and always ready to fight for her friends (even though there are points in the book where she almost gives in). 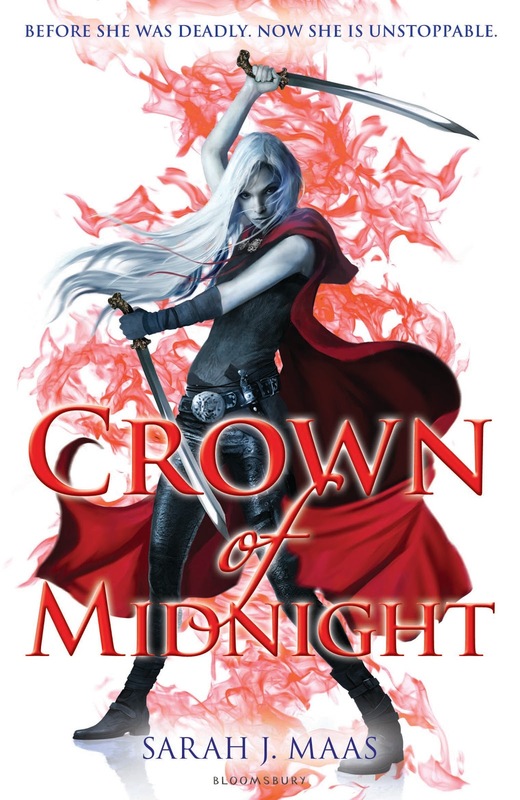 I don’t want to give too much away, which is why my description of the plot has been kind of vague, but Maas really takes the series to another level in Crown of Midnight, making the world we know bigger, the battles Celaena faces tougher, the enemies all around scarier, and the stakes much, much higher. It all ends with a bombshell that you could probably guess was coming, but is still a shock all the same. •Crown of Midnight is released on August 15 in the UK. How I got this book: From the publisher.